This edition of The Tempest by William Shakespeare from The Nonesuch Press, was bound by Annette Friedrich in 2012. Bound as a full leather fine binding in red-brown goatskin. Decorative tooling on the covers in white, grey, two shades of blue, metallic green and silver. The title is tooled along the center of the spine in metallic green with matte silver lines at the head and tail. On the inside, the paper bord-a-bord doublures are bright blue, matching leather joints and fly leaf in silver. All papers used are hand dyed. 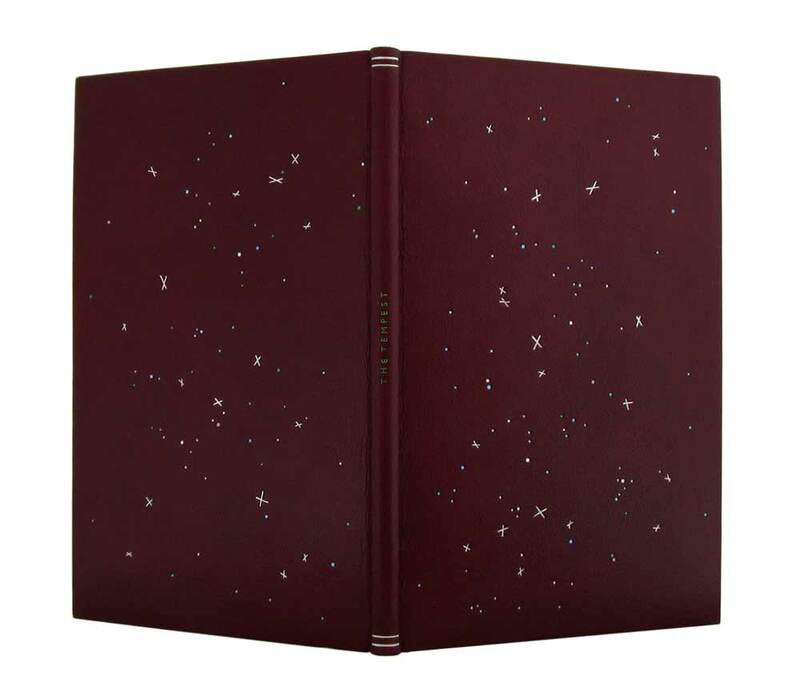 The binding is housed in a green chemise and slipcase. The chemise is decorated with linear tooling across the sides in two shades of blue. The author’s name is tooled in metallic green in the center the spine of the chemise along with tooled lines in matte silver and blue at the head and tail. I first stumbled upon Annette’s work through the Autumn 2012 Newsletter of Designer Bookbinders. The cover offers a detailed image of Annette’s binding Water bound in 2008. 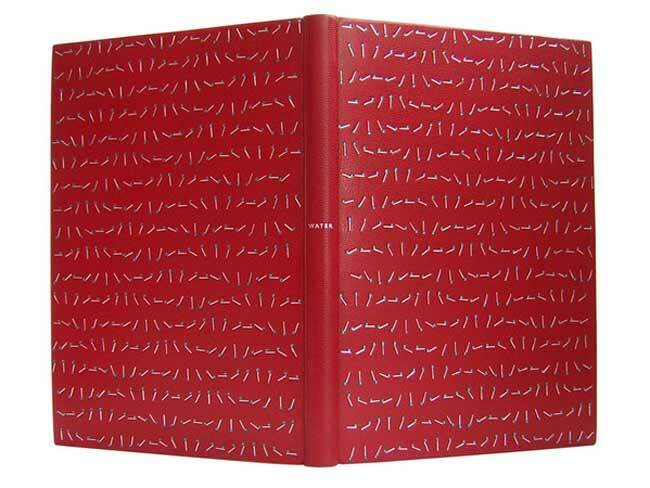 The fine binding work of Annette Friedrich is delightful! Her portfolio matures with every new binding as she skillfully depicts the essence of each story with delicate and artistic flair. Read the interview after the jump and come back each Sunday in the month of August for more posts on the work of Annette Friedrich. You received a Degree of Fine Art from the Burg Giebichenstein University for Art and Design, in Germany in 2004. What type of training in bookbinding did you receive? Where did your training take you after graduation? Before I started to study on the 6 year art course at the Burg Giebichenstein, I actually apprenticed as a very traditional bookbinder in a small trade bindery in Leipzig for two years. That was a terrific time! Apprenticeships in Germany are very strict and structured and are still overseen by the Guild. One works full time within the bindery, starting off with the very straightforward tasks and gradually easing towards the more complex ones. However the outlines of the Guild assure that the apprentice gets acquainted with the whole scope of bookbinding, so as a sidekick one gets occasionally pulled out of the day-to-day jobs and receives in-depth training by the master himself, focusing on skills and techniques, that are nowadays not that regularly called for in a commercial bindery. At the end of my apprenticeship I had to pass a very thorough hands-on examination (three days!) that was overseen by the Guild. I was able to survive and am very proud of my gained journey-man certificate. I was exceptionally lucky with my master, Hilmar Dettlaff. He was incredibly knowledgeable and thorough. And although having to work to speed and within a competitive environment, this never ever meant that we were cutting corners at any stage. Precision came first and last and I will be forever indebted to Hilmar Dettlaff for such a thorough grounding in my career. After my apprenticeship I headed towards the Fine Art course at the Burg Giebichenstein and studied with Prof. Mechthild Lobisch. The first year was dedicated to hands-on training to gain further knowledge in the high-end area of bookbinding. Again luck was with me, as I was actually the only student to enroll in that year, so I had a one to one training by the very wonderful and demanding master Ria Radicke. It was an incredible intense year and I was able to make good progress, but of course it takes years and years of training to truly get the hang of it! Only then did I fully join the Art class with Prof. Lobisch, 5 further years of blissful heaven! After my degree I moved to London in England. Here I was able to get my foot into two very different binderies for which I worked two days each. One was the restorer Charles Gledhill and the second was the bespoke contemporary bindery of Book Works. I know I am repeating myself, but luck just seemed to smile down on me! Working for Charles was an extraordinary opportunity. He thoroughly changed my horizon and perspective. He was very generous in sharing his knowledge of historic bindings and structures and above all pointing out the general ‘feel’ that a certain book would have to have and how they very much varied according to time and place. Don’t get me wrong though, I was at the lowest end of the workshop hierarchy and mostly did boxes and scraped off and relined spines… only towards the end of my three years of working for him was I allowed to get anywhere near to drawing on leather and the likes! Sadly I had to leave him when my own work started to take off and demanded more of my time. I still work at Book Works as a part timer though. Here we make bespoke bindings and tricky boxes. Nothing seems to be impossible. To my great delight I can get my hands into leather-work on a regular basis: full bindings, on-lays and in-lays and what not. I mentioned earlier that I believe that a lot of training is necessary to get into the swing of fine bindings (I would make a guess and say 100? at least?). The one problem with this figure is: how to get the training? Well! Thanks to Book Works I don’t have to worry about this any more!!! In 2012, you were elected a Fellow of Designer Bookbinders, which is considered the highest achievement of standards in design and technique. Can you talk about your path from Licentiate to Fellow and the binders who mentored you along the way? Albeit being German, I have been familiar with Designer Bookbinders from the age of 10 or so (my father is a very enthusiastic amateur bookbinder!) and ever since I have been pining for the annually published The New Bookbinder journal to drop on our mat: that was the world that I wanted to be part of! But only after a few years of living in England did I feel sufficiently bold enough to apply for Licentiateship. To my great delight I was accepted first time round and 7 years stretched out before me, in which, so is the understanding, I would get as much help and mentoring as needed in order to reach the high standard that is necessary as to be accepted as a Fellow. My two allotted mentors were James Brockman and Mark Cockram. James nearly fell over with surprise at our first meeting, for I mentioned that indeed I had applied for a apprenticeship with him 10 years earlier and that we actually had met before! He enquired good humoredly what his response might have been and I was glad to inform him, that he had not taken me on as his son Stuart was just about to start training in the Brockman bindery himself. But a close call it had been! With both mentors I met up on a regular basis. They were very thorough in their advice and generous with the time they gave to me. Both were invaluable in furthering my progress. Time flew bye and I lost a little track of the years, when all of a sudden Jo Bird applied for fellowship. I had had in the back of my mind, that she was a year above me and that the following year I had to face the panel of Fellows myself! Hesitantly I asked James if he thought that I should make a move into this direction and he responded with the enquire, how well I was able to cope with rejection? This set me thinking. I can deal very well with rejection if and when I have the feeling that I have given my all towards a set goal. But I felt that I actually did need a fraction more time. So I allowed myself an additional year to really get ready. The day of the application was a nerve wrecking experience and afterwards I packed up with trembling hands (I actually had to sit down and let 10 minutes pass, for fear of dropping my books!). To my great relief I was accepted and I felt very honored, a dream had come true! You have as a goal to create three fine bindings a year, are you producing work for clients, competitions or just for the love of binding? I do a little commission work and the occasional competition, but I feel happiest when working on my own projects and then sell them off after completion, luckily this has worked out so far for me. You’ve set out to bind all nine of Virginia Woolf’s novel as a part of a project titled ‘on a Stroll with Mrs. Woolf’. What inspired you to take on this extensive task and why did you choose Virginia Woolf? How many books have you completed at this point and which book do you plan to bind next? YES! ‘On a Stroll with Mrs. Woolf’ is my latest project. I plant to bind all nine novels by Virginia Woolf in chronological order. At the moment I am nearly done with her fourth: Mrs. Dalloway. How this project came about? A while back I noticed a shift in my work, I was letting go of the very linear approach and was interest to give my work more life and room to breathe. This was actually a direct consequence of having worked for the restorer Charles Gledhill. It had come as a complete surprise to me, that I found myself as appreciatively spellbound and intrigued by those old bindings as I was, that I encountered whilst working for him. I loved the lightness and ease of the ornaments and how they seemed to be dancing over the boards. WHY was that? I wondered. As they were surely as straight forward as anything? What made them so special? It took me a while to figure out that it was because of the slightly out of kilter appearance of the tooling. So! That was the way forward for me! Not an overnight decision, but a gradual shift within my perception. When I DID notice though, I was very aware that a fundamental change was taking place within my artistic practice and I wanted to bracket this ‘change’ within a set project. And as binding books is so closely linked to the content, I decided that I would need a strong partner in crime to reflect this process. I found the very person in Virginia Woolf. She was (and still is) one of the leading authors who significantly pushed the boundaries of literature into a new dimension. Phew! Scary and yet exhilarating! Her life’s work and pursuit in a nutshell! And where will I go? I don’t know. Though heading into unknown territory, that’s for sure! The designs on your fine bindings are very clean and consistent, by using simple line and decorative tools your designs are both chaotic and systematic. You also incorporate a range of vibrant leathers and foils. Do you find inspiration from the text or are there outside influences that inspire your designs? Yes, of course it is the text. Although not a certain scene, that I depict, but more the general feel and the sense of awareness that is within. Generally I am interested in quiet beauty. I like observing shifting clouds, the build up before an immanent thunderstorm, creating tension, fear, release and back to the gentleness. Something like that. 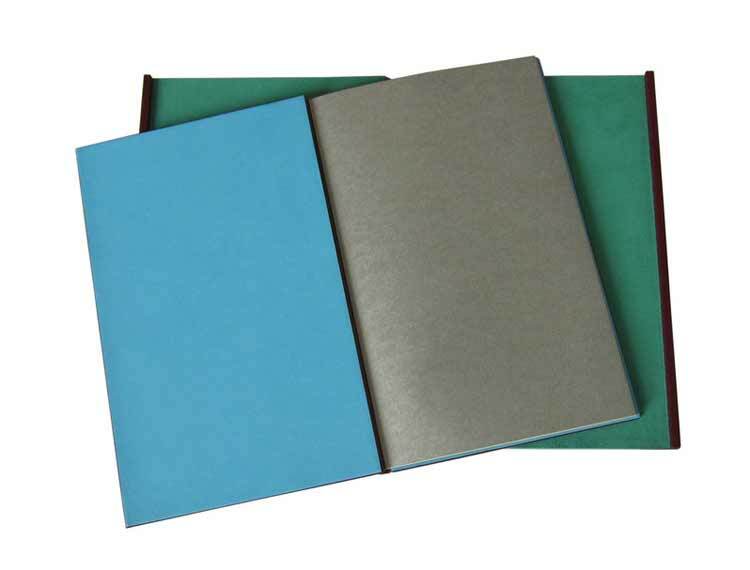 Your books are often housed in a chemise and slipcase, creating a well-developed professional portfolio. 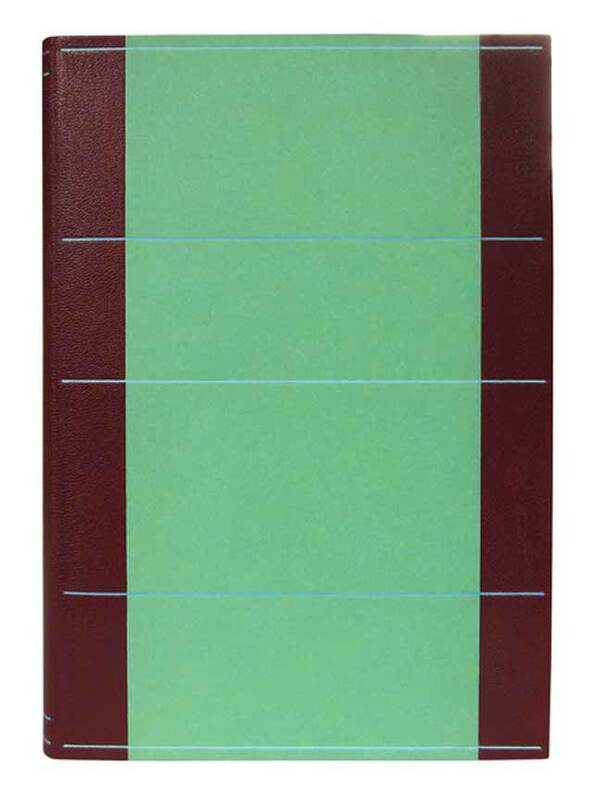 I admire when equal attention and skill is taken when designing the enclosure for a fine binding. Do have a certain philosophy for designing your enclosures? Well, I looove chemise and slipcases as they help to create the setting, the atmosphere of a binding. Recently I have started to use the chemises as juxtapositions to the bindings. To get a certain trill going (or thrill, if you like, but trill I mean). It creates another problem though, as the chemise and slipcases are very fragile themselves, so they live in a solander box in their turn. But rest assured, no more designing going on there, it is covered in black buckram! 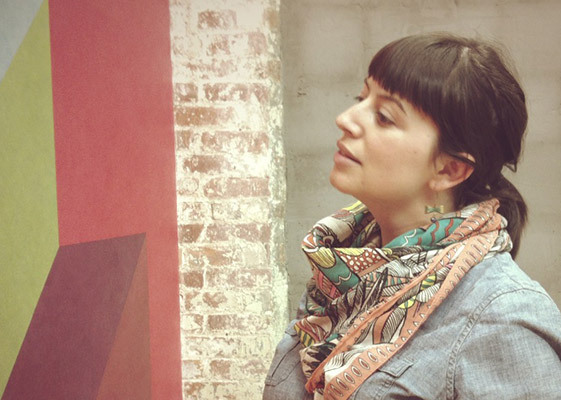 In 2007, you co-founded Club Mantell with 11 other artists with various artistic backgrounds. What type of activities or discussions do you and the other members participate in? We mainly meet up to work together in workshops. These are heated and charged get-togethers and we thoroughly enjoy our discussions. Sometimes we organize a joint exhibition or project, sometimes everyone is involved, sometimes only a small group works together. Although I am a bookbinder, I am an artist first and last, who happens to work within the world of bookbinding. They know me very well and can see beyond the initial ‘shape’ a work has (i.e. a binding). We are all aware that a certain medium does not have any impact as such on the artistic quality or concern within a piece. …nor does a given medium fool any of us into believing that it is per se of a higher level of interest or ‘contemporary’ impact. So we love to hackle and discuss and turn things over together. Well, what can I say! I love the discourse!